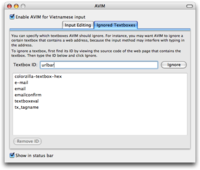 AVIM is a extension for Firefox and similar applications that provides an input method editor for Vietnamese, based on Hiếu Đặng’s embeddable script of the same name. Hiếu was the original developer of this extension; Minh Nguyễn is currently the lead developer. 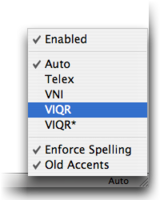 AVIM supports four standard input methods (Telex, VNI, and two varieties of VIQR), as well as a default “Mixed” input method, a combination of Telex and VNI. Unlike ordinary keyboard layouts, AVIM allows you to enter a diacritical mark anywhere after the letter it belongs to, and diacritical marks can be entered in any order. 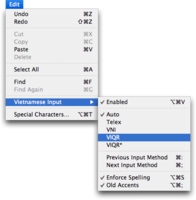 Various auto-corrections result in well-formed Vietnamese words. So if you use the VIQR input method, ddu+o+`ng, dduo+`ng, dduo+ng`, ddu+`ong+, duon`g+d, and even dduong+'?~.` all produce đường. 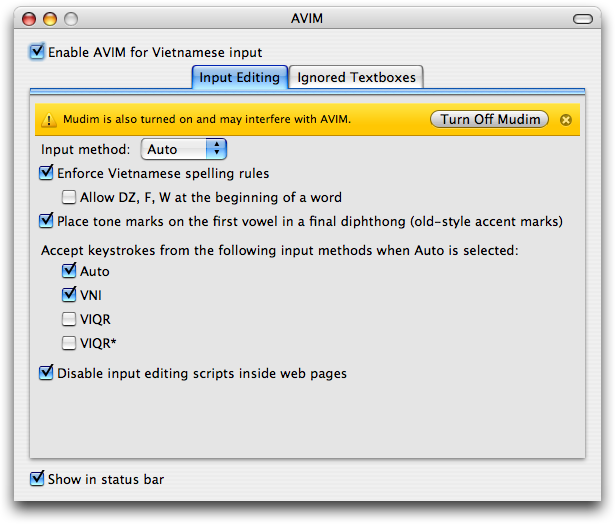 AVIM doesn’t provide complete spell checking – you need Vietnamese Dictionary for that – but its rule-based spell checking helps keep your writing free of errors. When AVIM encounters a word that doesn’t follow Vietnamese spelling rules, it treats additional keys literally, so a key that would normally add a diacritical mark to the word instead produces the original character for that key. This behavior is useful when using foreign words in your Vietnamese writing. AVIM understands both styles of placing diacritical marks – old (e.g., xóa) and new (xoá) – and auto-corrects your input to be consistent with your preference. Input editing bugs are uncommon, because AVIM is well-tested in a wide variety of situations. 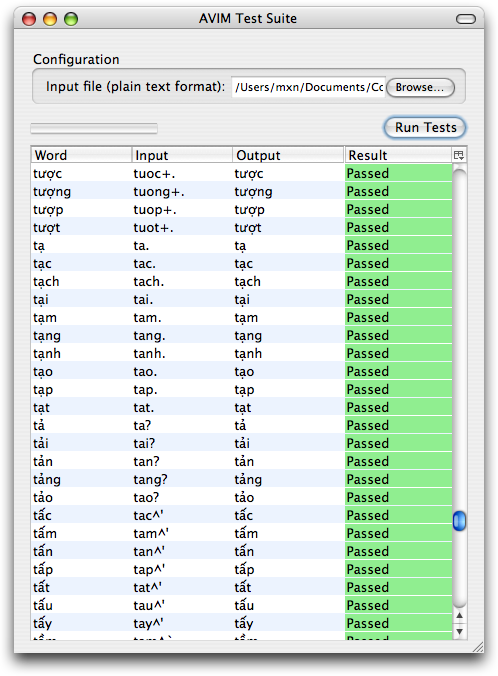 It has even been tested against the entire word list of the Free Vietnamese Dictionary Project. The script version, already in development by 2005, is used on websites throughout the Internet. Each day, thousands of Firefox users use the extension. A compact button on Firefox’s Add-on Bar, much like the panels along Microsoft Word’s status bar, displays the current input method. Left-clicking on the panel reveals a menu for disabling and customizing AVIM. The button can be hidden. A similar menu under the Edit menu provides access to AVIM’s basic options even if you hide the Add-on Bar button or your entire Add-on Bar. If you’re used to the row of radio buttons and checkboxes that most webpage-based IMEs include, the extension provides a set of toolbar buttons that you can add individually (View ▸ Toolbars ▸ Customize…). If you don’t use all five input methods, you can add just the ones you do use. A preferences dialog box, accessible through the Add-ons window (Tools ▸ Add-ons), allows you to configure AVIM’s behavior in detail. Several keyboard shortcuts keep you from having to reach for the mouse. 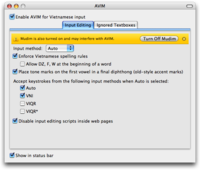 AVIM can be quickly enabled or disabled by toggling the Enabled option of either menu, or by pressing Ctrl+Alt+V (⌥⌘V on the Mac). This shortcut is useful when entering foreign words or source code into a webpage. AVIM is available in five languages – Dutch, English, German, Portuguese, Spanish, and Vietnamese – all in one small download. The extension automatically selects its interface language based on the Firefox localization that you’re using; if AVIM isn’t available in that language, it defaults to English. AVIM fully supports any webpage written in HTML, even full-fledged Web apps like Office Web Apps. AVIM is the only IME extension that supports the Microsoft Silverlight plugin. The extension supports the Songbird media player and Mozilla Thunderbird, Firefox’s companion e-mail client. Any change to AVIM’s configuration is immediately applied to any Firefox windows you have open, and is automatically applied to any Firefox windows you open from that point on. AVIM’s keyboard shortcuts don’t interfere with any of Firefox’s built-in shortcuts and also don’t interfere with shortcuts used by known extensions. Textboxes don’t scroll to the top or jump to the beginning every time you add a diacritical mark, and the caret stays in place when you undo. The preferences dialog box detects if the Mudim extension is also installed and turned on and offers to turn it off for you, preventing conflicts between the two extensions. AVIM doesn’t actually disable Mudim, but rather sets it to its Off mode. Similarly, a script monitor automatically disables in-page IME scripts that could interfere with AVIM. AVIM uses a completely standard user interface, so it looks like part of Firefox, no matter which Firefox theme you use. 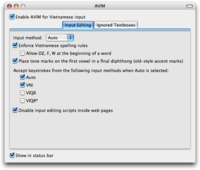 Compared to Mudim, CHIM, and Vietnamese Portable, AVIM is by far the most powerful Vietnamese typing tool you can download. Any other application based on Mozilla 1.8.1 or above. You’ll also need a compatible keyboard. The included input methods assume a standard U.S. English keyboard, but any keyboard that includes the required keys will suffice. The specific keys required depend on which input method you end up using, but all the input methods require the alphabetic keys (A–Z), and the extension’s keyboard shortcuts also require the colon (:) and semicolon (;). The VNI input method additionally requires the numeric keys (0–9), and the VIQR input method requires the following keys: left parenthesis ((), plus (+), backtick (`), apostrophe ('), question mark (? ), tilde (~), period (. ), backslash (\), and hyphen (-). The VIQR* variant substitutes the asterisk (*) for plus (+). If you want to type in Vietnamese inside Silverlight textboxes, you’ll need to install the Microsoft Silverlight plugin, version 2.0 or above. Finally, to properly display the accented text, you’ll need fonts capable of displaying the various Vietnamese characters. Most modern operating systems now come with Vietnamese font support. 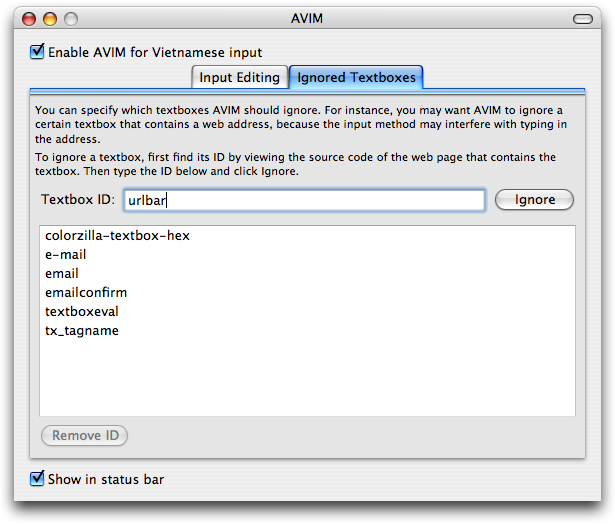 If you’re planning to use AVIM in Firefox, left-click on the link above. You’ll see a popup or banner indicating that Firefox has blocked the installation. Click Allow, then click Install Now in the dialog box that appears. Restart Firefox. If you’re downloading AVIM for another application, such as Thunderbird, right-click on the link above and select Save Link As. After saving the installer, open the destination application’s Add-ons window (usually by going to Tools ▸ Add-ons). Drag the installer into that window, click Install Now in the dialog box that appears, and restart the application. The extension installer is also available at the official Firefox Add-ons website. Hook (hỏi) ả ar or a3 ar a3 a? Dot below (nặng) ạ aj or a5 aj a5 a. Automatically transformed into the đồng sign when preceded immediately by a number (e.g., “1.000₫”). To enter an actual backslash, use two backslashes (\\). Nhuwxng ddieefu troong thaasy maaf ddau ddowsn lofng. Trowfi xanh quen thosi mas hoofng ddasnh ghen. Nhu74ng d9ie62u tro6ng tha61y ma2 d9au d9o71n lo2ng. Tro71i xanh quen tho1i ma1 ho62ng d9a1nh ghen. Nhu+~ng ddie^`u tro^ng tha^'y ma` ddau ddo+'n lo`ng\. Tro+`i xanh quen tho'i ma' ho^`ng dda'nh ghen\. Nhu*~ng ddie^`u tro^ng tha^'y ma` ddau ddo*'n lo`ng\. Tro*`i xanh quen tho'i ma' ho^`ng dda'nh ghen\. Try out typing with AVIM at the test page. By default, the Mixed input method accepts both the Telex and VNI input methods. You can change this behavior, as well as several other options, using AVIM’s preferences dialog box. If checked, AVIM is enabled. Otherwise, it’s disabled, so that typing proceeds as if the extension has not been installed. By default, it’s checked (enabled). This option is equivalent to the extensions.avim.enabled preference. Tag names very rarely contain non-ASCII characters. Ignoring the Location Bar is not recommended, because AVIM is useful when entering URLs of Vietnamese Wikipedia articles, for instance. However, you should ignore it if you’ve enabled the network.IDN_show_punycode option in about:config. If you use Telex, you may want to prevent yourself from accidentally entering diacritics instead of a hexadecimal code (for example, #èfe instead of #efefef). This option is equivalent to the extensions.avim.ignoredFieldIds preference. When the Mixed input method is selected, the Customize button is enabled. A separate dialog appears when you click the button. If any of the options in this dialog is checked, that input method’s keystrokes are accepted by the Mixed input method. By default, Telex and VNI contribute to the Mixed input method. These options are equivalent to the preferences beginning with extensions.avim.auto. If “Insert characters literally” is selected, AVIM works as a spell checker of sorts. Consider a word that doesn’t conform to Vietnamese spelling rules – which typically means it’s a foreign word or name. If you have chosen the Telex input method, as normally comes out as á, but if this option is checked and you type in Washington, you’ll get Washington; if “Apply diacritics to the word anyways” is selected, you’ll get Wáhington. By default, characters are inserted literally. This option is equivalent to the extensions.avim.ignoreMalformed preference. If checked, AVIM allows you to place accent marks on words that start with dz (equivalent to d) or f (equivalent to ph), even when spelling rules are being enforced. Such spellings aren’t acceptable in formal writing but are common in online forums. This option also allows the abbreviation “Ng̃” for “Nguyễn”. By default, it’s unchecked (not allowed). It’s equivalent to the extensions.avim.informal preference. If “The first vowel” is selected, AVIM ensures that you place tone marks on diphthongs the traditional way, so that both xo'a and xoa' produce xóa (using the VIQR input method). If “The second vowel” is selected, AVIM uses the newer style, so that both produce xoá. By default, the tone mark would be placed on the first vowel. 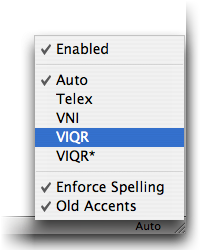 This option is equivalent to the extensions.avim.oldAccents preference. If checked, the script monitor is enabled. As soon as you type into a webpage, the extension automatically disables any IME scripts on that page that could interfere with AVIM. By default, this option is checked, so the AVIM/HIM, Google Virtual Keyboard, Mudim, MViet, VietTyping, and VietUni scripts are disabled. This option is equivalent to the extensions.avim.scriptMonitor.enabled preference. This button opens a separate dialog that allows you to choose which scripts to disable automatically. The script monitor is capable of disabling the following scripts: AVIM/HIM, CHIM, Google Virtual Keyboard, Mudim, MViet, VietIMEW, VietTyping, VietUni, and Vinova. They correspond to the preferences beginning with extensions.avim.scriptMonitor. If left unchecked, AVIM allows you to add diacritics to passwords, both on webpages and in the application’s user interface. By default, it’s checked (unaccented passwords). This option is equivalent to the extensions.avim.passwords preference. Use caution when using accented passwords on a website: the website may not handle Unicode passwords properly; additionally, you might not be able to enter your password correctly when you use a different computer. If checked, the Add-on Bar button is displayed; otherwise, it’s hidden. By default, it’s checked (displayed). This option is equivalent to the extensions.avim.statusBarPanel preference. Type general.useragent.locale into the Filter bar and wait a second. Double-click on the preference labeled general.useragent.locale. 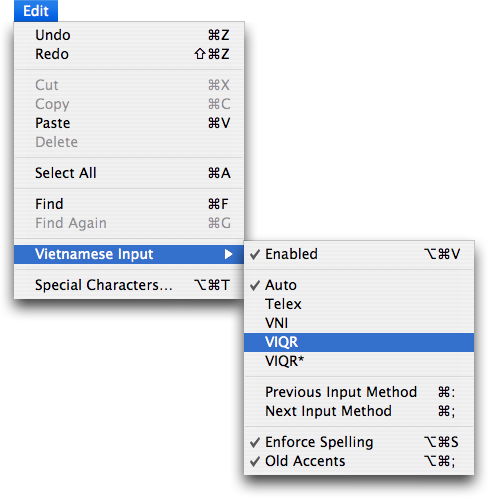 Type vi (meaning Vietnamese) into the dialog box that appears and press OK.
To undo the locale change, follow the above instructions, but instead of double-clicking on the preference, right-click on it and select Reset. Then restart Firefox. Thanks to Trần Xuân Huy for the tip. Due to technical limitations, Silverlight applets written using managed code are not supported. AVIM registers too many undo levels (about one per letter). In rich text editors, tone marks are lost when shifted to the last character in the word. For example, xo'a becomes “xoa”, instead of “xoá”, when the Old Accents option is disabled. Also in rich text editors, the caret may briefly appear in the wrong position after redoing. 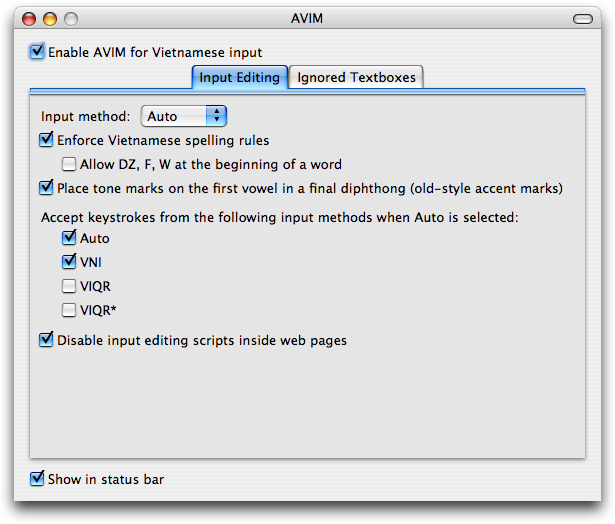 Neither AVIM’s Vietnamese Input menu nor its status bar panel function correctly in Songbird 1.8, though its keyboard shortcuts and preference pane continue to work fine. AVIM breaks Ace’s undo and redo functionality. When editing a bookmark’s tags, Firefox automatically suggests (“autofills”) tags and highlights those suggestions, interfering with AVIM. The Vietnamese Input menu doesn’t appear in ChatZilla. In Komodo IDE and Komodo Edit, AVIM doesn’t recognize custom dialogs created by project macros. Added support for editing Google Docs text documents created in June 2010 or later (requires Firefox 4 or equivalent). Fixed an issue in rich text controls where selecting text and pressing Backspace would delete one character too many. Added a Brazilian Portuguese localization by Mauro José da Silva. Added support for Zoho Writer. Added support for the Eclipse project’s Orion editor. Added support for Ymacs, an emacs-style code editor. If you’re proficient in Vietnamese, help Minh and Hiếu find words that AVIM doesn’t handle correctly. If you’re proficient in a language that AVIM isn’t available in, help translate AVIM into that language. It’s not much work, and you can translate online at BabelZilla. You must not claim that you or any other third party is the author of this software in any way. Copyright © 2007–2011 Minh Nguyen. In short, do pretty much whatever you want with this software, as long as you keep the copyright notices included with AVIM intact and don’t sue Minh or Hiếu if anything goes wrong. Two installable archives, avim.xpi and avim-version.xpi, should now reside in that directory. Produce an unminified build for the Firefox Add-ons site. The package will be significantly larger. Produce a BabelZilla-compatible build, to aid in localizing the extension. <em:localized> tags in the extension’s install manifest are removed, and included localizations are renamed according to BabelZilla’s predefined locale codes. Produce a testing build. The test suite is included, to aid in finding regressions. Print this help message to the command line. Produce a build compatible with the Songbird Add-ons website. The installer package will be significantly larger, because optional metadata is included with each file in the package. Override the package name. The default is avim. Override the version string. The default is based on the REVISION constant in config_build.py. Print the build script’s version to the command line. When you build a non-release (debug or localization) version of the extension, it includes an automated test suite. Although it’s still quite rudimentary, the test suite makes it quite easy to spot regressions in AVIM’s core functions. Install the debug build into a supported application. Open the application’s Add-ons Manager (Tools ▸ Add-ons) and select AVIM from the list of extensions. Click the Preferences button to open AVIM’s preferences panel and click the Open Test Suite button. Click the Browse button to specify the file to use as input. The plain text file should consist of a whitespace-separated list of well-formed Vietnamese words. Click the Run Tests button. AVIM enters the specified words using the currently activated input method. As each test runs, the tester updates a multi-column list with the original word, the keystrokes used to input the word, and the resulting text. The final column indicates whether the outputted text matched the expected output. Each row is highlighted in green or red, so that it’s easy to skim the list for any regressions. The test suite currently tests the selected input method, moving all dead keys to the end of the word. It accounts for automatic duplication of the horn diacritic (ơ and ư). Future improvements to the tester will allow you to verify that diacritical marks aren’t placed on malformed words. This website is copyright © 2007–2011 Minh Nguyen and licensed under the Creative Commons Attribution-ShareAlike License, version 2.5.